House. c1800. Colour washed stucco to front, rendered sides; hipped slate roof with rendered stacks at left end and right of centre. 2 storeys, rusticated on rendered plinth; symmetrical 7 bay facade, centre 3 bays recessed. Glazing bar sash windows with wooden bracket and panels above on first floor, channelled voussoirs over ground floor windows. Central 6 panel door under flat porch hood on multiple columns of quatrefoil section with string moulding at one-thirds and two-thirds height. There was obviously land attached to the house because an entry in Edward Ryde‟s diary of 20th August 1868 records Captain Harrow and I join the boys in Mr Bowles’ meadow where we have some cricket. According to the Tithe Map, this was land to the south of the house extending down to the river. The Court Rolls mention the transfer of a close of arable and another of meadow to Humphrey Bowles from the previous copyholder, Anne Wrightson. This must have been the same land. The earliest reference to a house on the site is in the Court Rolls of Woking Manor 1-3 Edward VI, “Henry Brabonde of Farnham and Joan his wife hold by copy (1541)……. one cottage with a garden existing near Park gate of Woking.” It has long been suggested that there was a gate to Woking Palace on the site of the Grange but there is no known documentary or archaeological evidence to this effect. If the reference in the Court Rolls refers to the Grange site, the cottage, as the term was then understood, would have been little more than a thatched hovel and there would be very little chance of any remains having incorporated in the present building. The John Holmes Map of 1709 (at Surrey History Centre) shows what appears to be an arched building to the north of what is now the Old House by Carters Lane. If this was the lost gate, then the cottage would have been on the site of the Old House. However, details of the buildings on early maps are often largely the imagination of the map maker. In 1620 Woking Palace was granted by James I to Sir Edward Zouch who abandoned it and built himself a new manor house at Hoe Bridge Place. With the abandonment of the Palace, the surrounding Park was turned over to farming and the tenants became known as farmers of ye Parke. This new phase probably gave rise to the building of farmhouses in the Park or the conversion of existing buildings to such use. According to the Church Rate Assessments of St Peter‟s, there were as many as seven farmers of ye Parke in 1675 and this would suggest that there should have been a similar number of farmhouses. The Grange at the edge of or just within the Park would probably been one of these farmhouses. By 1685 there were only three farmers, Richard Porter, Nathaniel Atfield and John Slyfield. The John Holmes Survey shows the house as held by John Slyfield in 1709. A John Slyfield, husbandman had a number of children baptised at St Peter’s between 1692 and 1703 and between 1715 and 1726. In 1719 John Remnant’s Map of the Royal Manor of Woking (at Surrey History Centre) describes the building on the site as 115 A messuage. When John Hassell painted his water colour of the house in 1823 (at Surrey History Centre), he described the house as The Parsonage. The Vicar of Woking, The Reverend Charles Bradshaw Bowles (1837-1866) lived there but he is said, during his term of office, to have built the Old Vicarage in St John‟s and lived there away from Woking village. According to an editorial note to the spoof And so to Mainford, it was only in 1899 that the building became known as ‘The Grange’. The Tithe Map of 1841 (above) has the Owner of the house as Humphrey Bowles and the occupier as Charles Bradshaw Bowles. Rev. Charles Bradshaw Bowles, his wife Sophia, daughters, Emily and Eleanor (bap1837 as of Pirbright) and three servants, Mary Duke, Emma Austin and Hannah King. 1851 The house is now called the Vicarage. Rev. Charles Bradshaw Bowles and his children, Emily and Eleanor, Georgina, Charles and Arthur plus a Swiss governess, Marie Brand Muller, a cook and housekeeper, Mary Hollman, an indoor servant, Harry King, a housemaid Emma Mead, a kitchen maid, Emma Roast and two nursery maids, Ellen Edwards and Sarah Spong. Rev. Charles Bradshaw Bowles, his wife Mary, and children Emily, Eleanor, Georgina, Charles, Arthur, and Mary plus Matthew Suter butler, William Cooke groom and coachman, Mary Spong cook, Mary Ann Hiller laundry maid, Harriett Reeves housemaid, Jane Humphries nurse, Mary Ann Hards kitchen maid and Ellen Rich nursemaid. There was also a two year old visitor, Arthur Robertson. Francis Wilson, clergyman, his wife Edith, their children, Graham, Edith and Margaret, visitors, Dorothy Biscoe and Augusta and their servants, Bertha Bye, nurse, Mary Eddins, cook, Annie Borrett, housemaid, Eliza Barber, laundry maid, Henry Trodd, footman and Christine Bierce, governess. Humphrey Bowles the owner of the house in 1841 died on 12th August 1859 and bequeathed the property to his son, Charles Bradshaw Bowles. In 1869 the house was taken by the Rev. Charles Arnold and became a school for boys known as Woking College. (see Appendix B) An entry in Edward Ryde’s diary of 7th September 1869 reads, Mr Arnold has taken Mr Bowles house. . At this time Mrs Arnold was alive. She is said to have walked out of church on 24th October 1869 because she didn‟t like the sermon being preached. The diary notes on 21st May 1871 that she was said to be dying of consumption and prayers were said at church. A note on the same day mentions Mr Arnold‟s French master playing selections from Norma and Trovatore in church to the deep regret of the congregation. Further entries record Mrs Arnold‟s death on the 22nd and burial on 26th. Edward Ryde took a great interest in St Peter’s and there are many entries in his diary recording conversations with Mr Arnold and hospitality accorded to him and his family. Apart from looking after his school, it would appear from the diary that Mr Arnold often helped at morning and evening services. Nevertheless, Charles Bradshaw Bowles retained the ownership of the house until his death on 26th August 1885. Earlier (12th April) Edward Ryde had noted in his diary), Arnold has sold his school and later (4th August) farewell dinner for Arnold who is going to Florida and (23rd and 28th August) Mr & Mrs Francis Wilson, Arnold’s successors. Charles Bradshaw Bowles bequeathed the house to his son Frederick Augustus Bowles who transferred the property to the Trustees of his marriage settlement. The Trustees sold the house to The Reverend Francis Wilson on 1st December 1893. As has already been stated there was a cottage on the site in 1541. It is unlikely that this would have survived and form any part of the present structure. What is more likely is that, following the abandonment of Woking Palace and the turning over of the Park to agriculture, one of the seven farmhouses was built where the Grange is today and that it survived as one of those farmhouses when the number of farm holdings was reduced to three. Such a building would more likely than not have contained bricks and timber brought from the abandoned Palace. The John Holmes Map of 1709 (at Surrey History Centre) appears to show a brick built L shaped house on the south of the plot with another building running west east on the north side. The John Hassell water colour of 1823, the Tithe Map of 1841 and the plan shown in the margin of the Indenture of 1893 show the present house has not changed much since then. It is possible that parts of the original farmhouse still exist within the present structure. The pictures below all show items in that part of present buildings which corresponds to the original farm house. 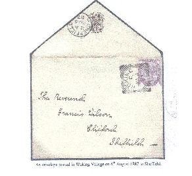 There is, however, no real evidence to dispute the listing date of circa 1800. Church Cottage adjacent to High House was the infirmary and this explains why there is no entry for the cottage in the 1881-91 Censuses. 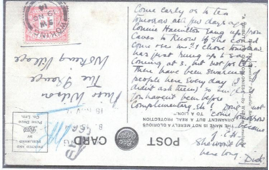 There is an entry in Edward Ryde’s diary for 20th March 1873 which reads, Call on Arnold. He walks with me to the Polling Place in Church Cottage where I vote for the School Board. Edward Ryde’s diary, now in the care of the Surrey History Centre, is an important source of information. He was born in Woking on 4th September 1822 the eldest son of Edward Ryde, miller and his wife, Maria and married Sarah daughter of Mr Robert Harrow at Alton parish church on 16th January 1848. 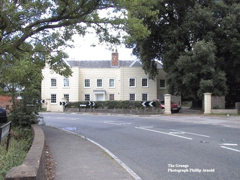 He was surveyor for many railway companies during the Railway Age and had built and lived at Poundfield House on the corner opposite the Grange where Poundfield Cottage and a modern housing estate now stand. Up to 1878 Poundfield House was, in effect, his country house but he always took a great interest in Woking affairs – he was a member of Woking Choral Society – and carefully recorded in his diary the comings and goings in the neighbourhood. This separate dwelling behind the Grange must, as its name implies, have been the old stables to the main house. According to the Tithe Map the owner and occupier of the property were as for the Grange. It is said that the Rev Charles Bowles, who was living at the house at the time of the 1841-61 Censuses returns, moved to the Grange because he found the previous vicarage the Old Vicarage was too cramped for his wife and 11 children! PM By 1838 he had set up a small school in the village, AC, which was supported by voluntary contributions GD. The number receiving instruction was 170 boys and girls. The Rev.Charles Arnold, took over the house from the vicar, Charles Bowles and set up Woking College in the premises. By 1871 the school had 60 pupils from all over the country.AC . When Francis Wilson MA took the house over, he continued to run the establishment as a preparatory school, but it seems, on a smaller scale. Wilson’s Prospectus is very brief and is titled Woking College, Woking, Surrey. There is a copy of this at the Lightbox. He is described as of Emmanuel College, Cambridge, 2nd Class in the Classical Tripos of 1888, Assistant Master in Cheam School. Francis Wilson lived here with his wife, Edith, their son, Graham Francis Winstanley, their two daughters, Margaret Elizabeth (Madge) and Edith Irene Matilda (Hilda) and his mother. Much later Miss Madge would relate her childhood memories of the Edward Ryde’s visits to The Grange. The family would walk across the road from Poundfield House opposite to take tea but, when occasionally visiting for dinner, they would have the carriage harnessed up and be driven the 30 yards or so to the Wilsons’ house. Denis Upcott says Mrs Frances Wilson, (Rev. 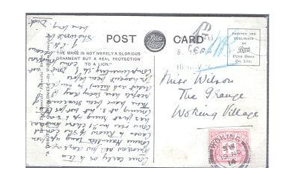 Wilson’s Mother) died in 1901 and Mr John Wilson (his father?) in 1905. However, there is no entry for Mrs Wilson in the St Peter’s burial register and although there is an entry for a Mr John Wilson of Westfield who was buried on 10 May 1905, there is nothing to confirm that this relates to Francis Wilson’s father. Mrs Edith Wilson, Francis Wilson‟s wife, owned two black houses in Rydens Way, on the site of Woking College. These were let to gypsies. She ran a Sunday School for gypsies and gave them Christmas Dinner at The Grange. The Rev. Francis Wilson died in 1932 aged 84. …. and the other way round! TM 153 the Tithe Map reference for the Horsell, Sutton and Woking Maps. These references are correct for isolated easily identifiable buildings but only approximate for individual buildings in groups of buildings eg one house in a street of houses. FT Frank E.Taylor’s Local West Surrey Directory of 1913. 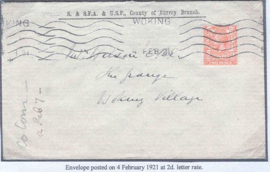 EWB see RS36 Early Woking Buildings published by West Surrey Family History Society, 17 Lane End Drive, Knaphill, Surrey GU21 2QQ. £4 post free in UK. (01483 472507).